BH Tool of Salt Lake City, UT uses many tools in its quest to achieve the highest possible quality and precision. But sometimes the most effective arrow in the quiver isn't the most expensive, according to owner Bryan Haslam, who has discovered the perfect balance of high- and medium-tech for his tool-making operation. One of the devices the company uses to attain its high degree of accuracy is the HAIMER Zero Master 3D Sensor. 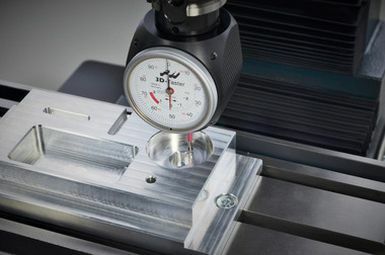 It enables a machine tool operator to accurately and easily measure and identify X, Y and Z workpiece dimensions. The workpiece can be approached from any of the three directions. Once the gage reaches "0", the machine is resting directly over the edge of the workpiece. No calculations are needed. "Technologically, it's kind of the middle ground," says Haslam. "There are very high-end pick-up probes that are integrated with the controller. Then there's something more straightforward like the HAIMER sensor for a normal CAT 40 shank." With the Zero Master, Haslam says he reduces costs, increases productivity on the shop floor and offers relief to his operators through its ease of use and improvement on more traditional edge finding methods. "Less expensive edge finders are slower and often knock themselves off center once they find the edge," Haslam says. "They can also leave marks on the softer materials like aluminum. 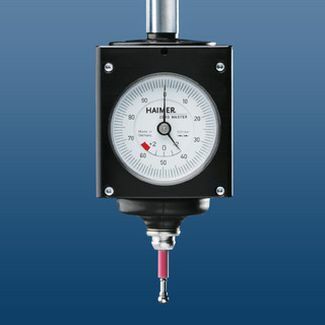 "The Zero Master isn't better than an automatic, higher-end, integrated probing device," Haslam continues, "but as a tool maker where everything changes constantly and nothing is really a repeat job, the cost and straightforwardness of the HAIMER unit fits the situation. In every respect, the HAIMER 3D Sensor does the same job (as the more expensive probing systems) without all of the electronic trickery." The bottom line, according to Haslam, is the result. "I'm getting 50 percent better accuracy and 50 percent more speed using the Zero Master than I would be without a tool like this." The Zero Master has another advantage, says Haslam. "One thing that makes it unique from the most fundamental edge-finding devices is the ability to measure in the Z axis for setting depth as well as the X and Y," he says. "Typically, the other methods for edge finding do not deal with the Z axis. The HAIMER 3D Sensor does." The use of HAIMER's Zero Master 3D Sensor is just one aspect of BH Tool's commitment to quality and precision. "We select only top-quality machine tools and all associated tooling, inspection and measuring methods," Haslam says. "Materials are purchased from only the best suppliers and heat-treating for hardened tooling is given the utmost attention, for quality results and longevity. Attention to every small detail is the BH Tool standard."